I have been lunching at Hong Lim food centre pretty often lately but somehow just didn't get the chance to try the Tanglin Crispy curry pok until much later. 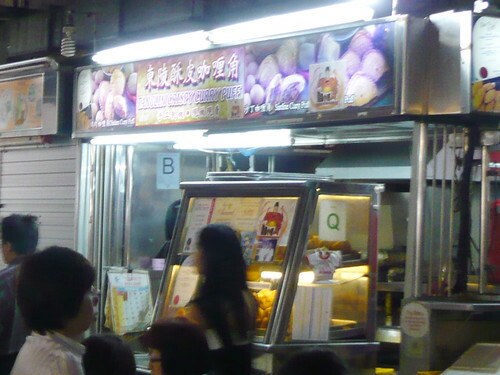 In fact, it was the branch at Whampoa Market (6:30am!) that I had my first taste of the curry pok. So here's the low down on the curry pok. The skin crust is superb! Very crisp! It is the same shell type that you find on the Airport Road curry pok. As usual, I bought 1 potato and 1 sardine but unfortunately, the skin was as good as it got. The insides tasted pretty "normal". No big deal leh. So thinking that maybe this Tanglin Curry Pok branch at Whampoa Market is not so good, I decided to try them at the Hong Lim food centre two weeks later. So two weeks later, I ate the first one. Hmm..... tasted much better. Got a little spicier kick then a fortnight ago but disappointed not to have any potato chunks for texture. Then I ate the second one thinking it was the sardine one. Eh. How come this one is also potato?? Then it dawned on me that the first one I ate was the sardine puff. Quite unexplainable why I was not able to tell it apart from the potato? Ingredient cross contamination during preparation? I wonder. So verdict? Crust is damn good but everything else is disappointing. Oh and another thing, I was in Melaka last week and stop by Gelah Patah Esso Station to refuel on my way back, when I saw them sell Curry Pok together with the yummy chicken drumlets. The drumlets were terrible but possibly due to the fact that they were leftovers as by the time I was there, it was around 6pm. The curry poks? 3 words. Cannot Make It. In other news, I was pleasantly surprised that to get an email from Sharon (Aunty Lucy's daugther) from Aunty Lucy's Curry Pok in response to my earlier blog. FWAH!! AUNTY LUCY CURRY POK GOT PR DEPARTMENT ONE SIAH!!!! AUNTY LUCY CURRY POK GOT FACEBOOK PAGE ONE HOR!!! DOUBLE FWAH!! !